On November 3 2000, Madonna guested on CBS-TV’s Late Show With David Letterman to promote the Music album. She performed an acoustic version of the album’s second single, Don’t Tell Me. 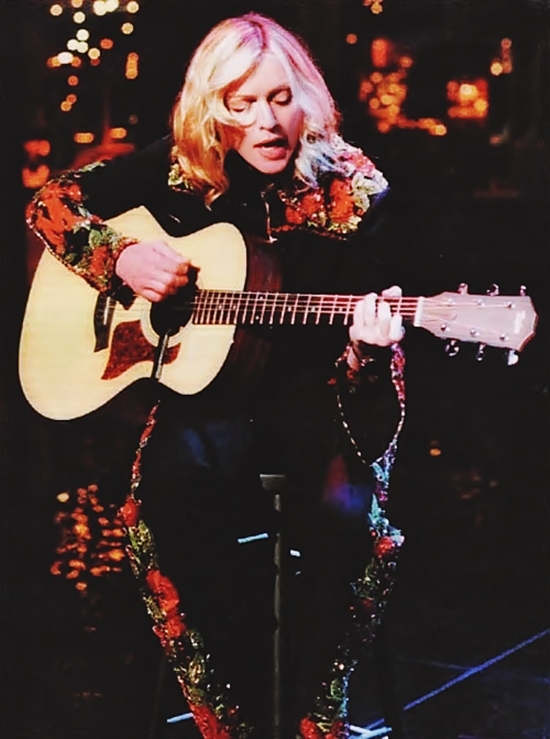 The performance featured several firsts for Madonna: her first live performance to promote the Music album; her first TV appearance following the birth of her son Rocco; her first performance on guitar since her pre-fame days in NYC band Emmy; her first unplugged/acoustic live performance; her first live performance with longtime guitarist Monte Pittman; and her first (and only) musical performance on the Late Show. Despite being promoted as such, it was not, however, Madonna’s first time back to the Late Show after her infamously censored 1994 appearance. She had made a brief, unscheduled visit to the set to drop off a valentine for Letterman during a 1995 taping of the show. I absolutely love the live version of Don’t Tell Me! Showing her guitar ability and acumen, the song portrays Madonna as unrepentant Rebel Rocker!